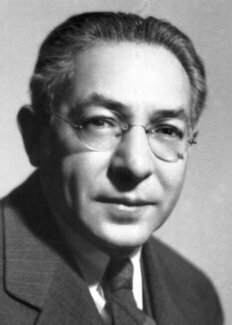 Isidor Isaac Rabi was born in Raymanov, Austria, on July 29, 1898, the son of David Rabi and Janet Teig. He was brought to the United States by his family, in 1899, and his early education was in New York City (Manhattan and Brooklyn). In 1919 he graduated Bachelor of Chemistry at Cornell University (New York). After three years in non-scientific occupation, he started postgraduate studies in physics at Cornell in 1921, which he later continued at Columbia University. In 1927 he received his Ph.D. degree for work on the magnetic properties of crystals. Aided by fellowships, he spent two years in Europe, working at different times with Sommerfeld, Bohr, Pauli, Stern, and Heisenberg. On his return in 1929 he was appointed lecturer in Theoretical Physics at Columbia University, and after promotion through the various grades became professor in 1937. In 1940 he was granted leave from Columbia to work as Associate Director of the Radiation Laboratory at the Massachusetts Institute of Technology on the development of radar and the atomic bomb. In 1945 he returned to Columbia as executive officer of the Physics Department. In this capacity he is also concerned with the Brookhaven National Laboratory for Atomic Research, Long Island, an organization devoted to research into the peaceful uses of atomic energy. His early work was concerned with the magnetic properties of crystals. In 1930 he began studying the magnetic properties of atomic nuclei, developing Stern’s molecular beam method to great precision, as a tool for measuring these properties. His apparatus was based on the production of ordinary electromagnetic oscillations of the same frequency as that of the Larmor precession of atomic systems in a magnetic field. By an ingenious application of the resonance principle he succeeded in detecting and measuring single states of rotation of atoms and molecules, and in determining the mechanical and magnetic moments of the nuclei. Prof. Rabi has published his most important papers in The Physical Review, of which he was an Associate Editor for two periods. In 1939 he received the Prize of the American Association for the Advancement of Science and, in 1942, the Elliott Cresson Medal of the Franklin Institute. He was awarded the Medal for Merit, the highest civilian award in World War II, in 1948, the King’s Medal for Service in the Cause of Freedom the same year, and is an Officer of the Legion of Honour. He is an honorary D. Sc. of Princeton, Harvard, and Birmingham Universities. He is a Fellow of the American Physical Society (was its President in 1950) and a member of the National Academy of Sciences, the American Philosophical Society, and of the American Academy of Arts and Sciences. In 1959 he was appointed a member of the Board of Governors of the Weizmann Institute of Science, Rehovoth, Israel. He holds foreign memberships of the Japanese and Brazilian Academies, and is a member of the General Advisory Committee to the Arms Control and Disarmament Agency, and of the United States National Commission for UNESCO. At the International Conference on Peaceful Uses of Atomic Energy (Geneva, 1955) he was the United States delegate and Vice-President. He is also a member of the Science Advisory Committee of the International Atomic Energy Agency. Dr. Rabi married Helen Newmark in 1926. They have two daughters. His recreations are travel, walking, and the theatre. Isidor Isaac Rabi died on January 11, 1988.